"Please Touch Museum I Family Activities L Kids Parties « Please Touch Museum." Please Touch Museum. Please Touch Museum, n.d. Web. 19 Jan. 2016. Goldwyn, Rob. "For Whitey, It's A Funeral ... Inside The Park City Offers Memorial Hall For An Unprecedented Viewing & Public Service A Simple Ceremony Simply Impossible Memorial Hall Site Of Public Service For Whitey." Philly.com. Philadelphia Daily News, 11 Sept. 1997. Web. 19 Jan. 2016. Museum Planning Inc. (New York). The Centennial Museum, 1776, 1876, 1976: [study]. [New York: Museum Planning Inc., 1970. Pennsylvania Museum and School of Industrial Art. 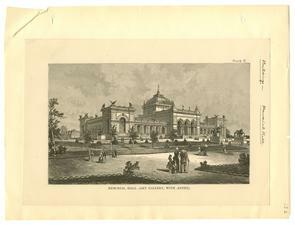 Handbook: Memorial Hall, Fairmount Park. Philadelphia, 1907. Trumbull, Rebecca. Memorial Hall: A History. Philadelphia, PA: n.p., 1986. Print.